Professor Jane Ridley read History at St Hugh’s College, Oxford, graduating with a First Class degree. Between 1974 and 1978 she was a research student at Nuffield College, Oxford, and in 1985 she gained a DPhil in Modern History for her thesis “Leadership and Management in the Conservative Party in Parliament 1906-1914”. Her link with Buckingham began in 1979 when she became a Lecturer in History. 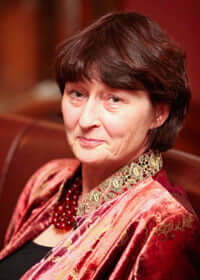 She was made a Senior Lecturer at Buckingham in 1994, a Reader in 2002 and Professor in 2007. Since 2003 she has served as Senior Tutor, with responsibility for student discipline. Her publications include The Letters of Arthur Balfour and Lady Elcho (1992) and The Young Disraeli (1995). She has written a history of Fox Hunting (1990). She has published articles in learned journals and she has contributed widely to the Oxford Dictionary of National Biography. Her biography of Edwin Lutyens, The Architect and his Wife (2002) was awarded the Duff Cooper Prize. She reviews regularly for the Spectator, the Literary Review and the Times Literary Supplement. She is excited by broadcasting on Radio 4 and contributing to TV documentaries on history such as “Queen Victoria’s Children” and “Edward VII: Prince of Pleasure”. Her latest publication is a major new biography of King Edward VII: Bertie: A Life of Edward VII (Chatto & Windus, 2012). In 2008 she was awarded a Leverhulme Research Fellowship to complete her work on this project. It was the highest-rated biography in Books of the Year for 2012 (according to The Guardian). Jane Ridley teaches History and runs the MA in Biography which she founded in 1996. Ridley, J. Victoria (Penguin Monarchs): Queen, Matriarch, Empress (London: Allen Lane, 2015). Ridley, J. Bertie: A life of Edward VII (London: Chatto & Windus; New York: Random House, 2012). “‘The sport of kings’: Shooting and the court of Edward VII”, The Court Historian 18 (2013).